AskBTS: Newsletter - Thunder in the Cloud? BTS Newsletter: Thunder in the Cloud? What Can Technology Do For My Company? You have certainly heard by now that the cloud offers off-site security, disaster protection benefits, and management of servers and data by IT professionals. That's all good news. Most businesses, however, do not think about upgrading their Internet connection before they make the move. Today your production data is on your office server down the hall on a speedy 100Meg LAN connection. Now transition that same data to a cloud provider whom you connect to over an Internet connection. Oops? Oops is right. DSL and U-verse upload speeds are not even functional. A dedicated T1 or a bonded T1 service 3Mb, 6Mb etc. may still be business limiting by a factor of 10 or more based on what you were comfortable with in a native environment. Frustrated? An understatement, I am sure. The Cloud requires connectivity speed. Fiber is now more available than ever before. Carriers are delivering fiber, in most cases with no installation cost to businesses, and are offering speeds up to and including gigabit. The sweet spot from a pricing and performance perspective is a 30-100Mb connection. Coaxial services are also offering improved speeds at good values—though there are some performance limitations. If you are considering a move to the cloud, put a priority on upgrading your Internet connection. This is not really a suggestion, but a business requirement. Upgrade your Internet speed "first" and also plan for a back-up route. The ideal deployment is fiber as a primary route and coax as a back-up. Business continuity is key. Increase the connectivity budget at your business and get to fiber. BTS represents all of the major providers. Give us a call. We will answer your questions and help you get there. You don't want thunder in "your" Cloud! One of my favorite axioms is "technology is a tool." As a rule, we should evaluate any technology we plan to implement based on what the tool can do for our companies. As a self-proclaimed geek, I can understand how easy it is to get caught up in the latest gadget or the newest trend in technology and come to believe we must have it. The truth is that we should carefully consider what the technology brings to the table before deciding to invest in it. As a member of the national trade organization Technology Assurance Group (TAG), BTS is taught to evaluate each technology we are proposing to our customers with two questions. First, will it provide our customers a competitive advantage in their marketplace? Second, will it make our customers more profitable? If we cannot answer in the affirmative to one or both of these questions, we should not present the technology to our customers. There are many forms an affirmative answer to these two questions can take. Does the technology help our customer take better care of their customers? Does it reduce costs? Does it help to increase revenue? Does it make employees more productive? That is why we believe it is important to understand our customers' business and try to get beyond just providing quotes. It is also important to understand the medium and long-range plans our customers have for their business. Most small and medium-sized businesses (SMBs) do not have the resources to hire a CIO or IT Director, but all businesses need someone to help align the technology their company runs on with the goals and vision the CEO or owner has for their business. Each company should find someone they trust to help them with this task. We, at BTS, strive to be that resource for our customers. I believe we are standing on the cusp of a great change in our society which will be pushed by technologies such as robotics and artificial intelligence. In the last century, a lot of labor-intensive tasks were replaced by technology, and now we see technology starting to make inroads to tasks assigned to knowledge workers. At this point, it is obvious that technology is critical to our businesses, but I think we all need to consider the long-term effects of the technology we implement. We believe it is our job to help you navigate these issues and stand ready to do so. We place such a high value on reading at BTS because it shows a willingness to learn and improve. It tells me that a salesperson will do the research to understand what problems face the customer, not just in their business but in their industry as a whole. Does a lawyer go to court without researching the case at hand? They most certainly do not, and if you have a lawyer who does I would run away as fast as I could! A salesperson who does not read does not want to earn anybody's business. When we meet for our sales meetings, I make sure to ask if anyone has read anything interesting/started something/seen a great article. It then becomes reading for the rest of the group in between having the staff read works such as How to Win Friends and Influence People or Getting to Yes. The more we learn about our craft, the better we can assist our future customers and help steer existing customers in the right direction. Hands down, successful sales people read. I want nothing but successful sales people. Otherwise, we are wasting each other's time. If you would like to discuss any of the books listed or talk about how we hire salespeople, please feel free to contact me at 205-290-8460 or williamw@askbts.com. Inclement weather alert! Everybody head home now! Snow or wintry mix? Well, probably not again until next year, but what about severe thunderstorms, tornadoes, or long-term power outage? What do you need to do so your business telephone calls are answered? With many of our phone systems, there are a couple of options that you need to take advantage of. First, make sure that you have a night greeting or alternate greeting set up for your telephone system. Second, make a note of the greeting mailbox and access code. If inclement weather or an unforeseen event occurs, all you need to do is change the greeting by dialing the greeting box and dialing the code. Now, pick a safe place to keep this info and you are all set the next time you need to "hit the door." What else...? Do you have a battery back-up unit on your telephone system and carrier router for voice lines? If there is no power to your equipment, no one will hear your greeting. Please contact BTS Service at 290-8301 or service@askbts.com if you need help with box numbers, access codes, or backup power units, or if you have questions about how your system can work when inclement weather arises. If you have an NEC IPK, IPK II, SV8100, or SV9100 phone system, you have the ability to place a call on exclusive hold. This means that the call can be picked up only from your phone. How? With the call in progress, just press your Hold button twice. Easy! 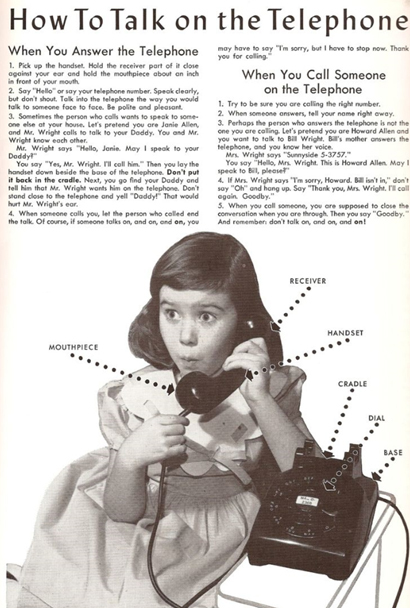 How to Talk on the Phone ... for Children! These days, a lot of children know how to use a phone (and maybe even have their own) practically before they can walk, and many know how to use one better than their parents do! Still, it's fun to take a look back at the good old days when children were taught to use telephones...and to use good manners when making and receiving calls. Sometimes you need to have two applications open at the same time. Wouldn't it be pleasing if they could appear side by side, each one taking up exactly half of your computer screen? Here's how you can make that happen! Open the first application and click on it. Press the left arrow (or the right arrow, depending on which side of your screen you want the application to be on). Now repeat with the other application, but click the other arrow so this one will go to the opposite side of your screen. You are done! *This is especially nice if you have two monitors and need four applications open at the same time. At BTS, we know that any technology is only as good as your ability to use it. To this end, we offer webinars to help our customers get the most out of their technology investment. BTS will be offering several webinars this quarter. Each one will be offered on a Tuesday afternoon at 3:00 p.m., Central Standard Time, and will last no more than thirty minutes. To reserve your space or to request additional information, please email Kim Reynolds. If you would like to suggest a topic for one of our future scheduled webinars, let us know! Field Engineer Cory Simpson is now Polycom certified. This means he is now fully qualified to work on Polycom SoundStructure devices. Congratulations, Cory! Field Engineer Rick Corbett has been with BTS since July 2011. A highly qualified IT technician, Rick has his MSCA for Windows Server 2012 and his MCSE for Server Infrastructure. Rick was born in Houston, Texas, but his family moved to Birmingham when he was a year old. He attended the University of Alabama in Tuscaloosa and graduated in July 2011 with a double major in Public Relations and Political Science. Married to Ellen since June 2012, Rick is an avid home brewer and enjoys reading and playing computer games. In next quarter's newsletter, the spotlight will be on Customer Relationship Manager/Trainer Kim Reynolds. See who you're talking to when you call BTS Service! Right now, BTS is very interested in talking to young adults interested in an entry level/apprenticeship technician position. No experience necessary—just an excellent work ethic and a desire to learn about phone, voice mail, and computer systems from the ground up...and from the best! If you think you might be a good fit for our excellent team, please feel free to send your resumé to hr@askbts.com.